This statistic depicts the percentage of U.S. suicides with known or unknown mental health conditions as of 2015, by method of suicide. 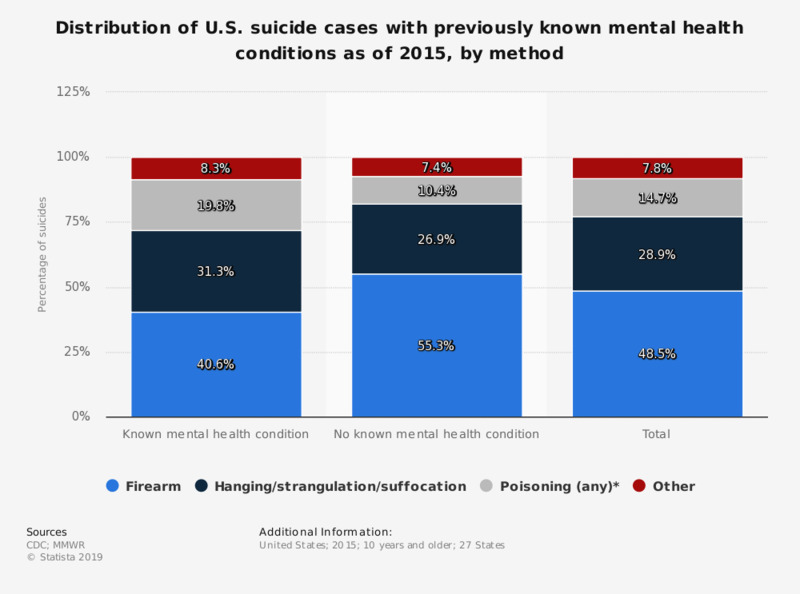 According to the data, suicide by firearm accounted for 48.5 percent of all suicide deaths that year and 55.3 percent of all suicide deaths among those with no known mental health condition. * Percentage of poisoning suicides/ denominator is decedents who died by poisoning, including overdose. Everything On "Suicide" in One Document: Edited and Divided into Handy Chapters. Including Detailed References. Do you consider suicide morally acceptable or morally wrong? Do you consider doctor-assisted suicide morally acceptable or morally wrong?